Our traditional 5:1 marine epoxy resin bonds with fiberglass, other composite fabrics, wood, and metals, curing to a high-strength solid suitable for coating, bonding, laminating, fairing, and reinforcing. 100% compatible with other 5 to 1 epoxy systems. Note: Resin group sizes correspond to sizes of TotalBoat Fast, Slow, Tropical (extra slow), and Crystal Clear Hardeners. Resin ONLY, hardeners must be purchased separately. Kits containing resin and hardener are also available. We’ve used our years of experience to make the TotalBoat 5:1 system of epoxy resin, hardeners, and fillers as DIY-friendly as possible. From the way it’s measured and mixed, to the thickening agents you can mix in to make it do what you want it to do. One pump of resin and one pump of hardener is all you need to get the proper 5:1 mix. For bigger batches, it’s just as easy to measure precise amounts by weight or by volume. No guessing that might result in unusable glop. Because it’s so strong and versatile, there are many things you can build or fix with our 5:1 epoxy resin. From bonding and coating, to laminating and fairing, we have a comprehensive line of hardeners and fillers to suit the job. 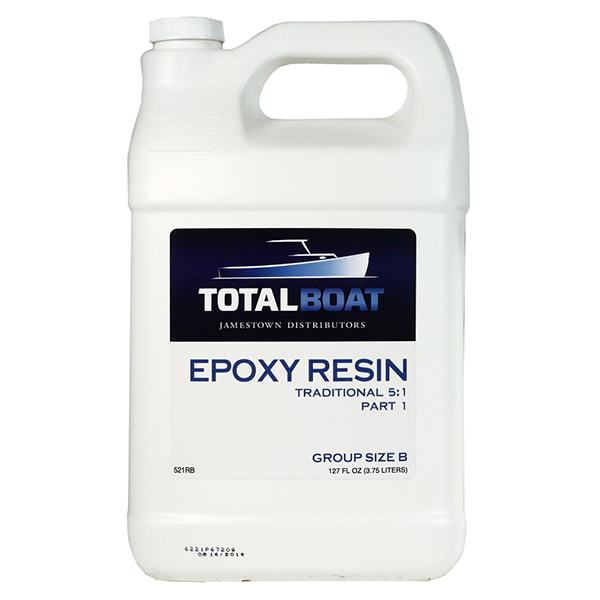 TotalBoat 5:1 resin formula is also 100% compatible with other traditional 5:1 marine epoxy systems. Use it with other or specialty hardeners and fillers without worry. TotalBoat epoxy is packaged so nothing gets wasted. For example, the Size A 5:1 Epoxy Resin and the Size A Hardener are made so when they are dispensed 5:1, the packages will empty at the same time, so there’s no wasted product. When you buy more, you can reuse your existing pumps. And because you can use TotalBoat 5:1 Epoxy Resin interchangeably with other traditional 5:1 epoxy systems, you can mix and match to use up the products you already have. Pot Life at 75°F 12 min. 20 min. 46 min. 20 min. Work Life at 75°F (Thin Film) 60 min. 90 min. 3-4 hrs. 3-4 hrs. Set Time at 75°F (Thin Film) 6 hrs. 10 hrs. 20-24 hrs. 10-15 hrs.